111. Per Ove Oppedal on Istind. A first ascent on the last day of climbing for the Norwegian G4 Expedition. 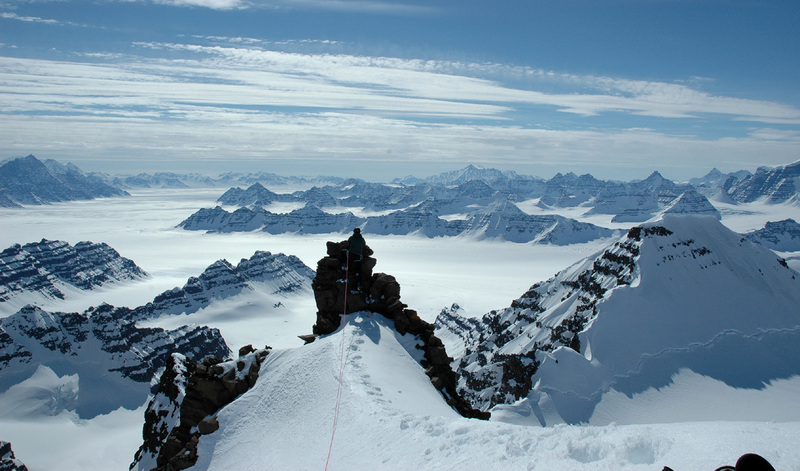 On 15 May the 6-man G4 Expedition (Norway) flew in to the glacier below Gunnbjørnsfjeld and from there made ascents of Gunnbjørnsfjeld, Dome and Cone. Per Ove Oppedal and Torstein Skage carried skis to all three summits and made the first ski descents of Gunnbjørnsfjeld and Dome. They also made the second ski descent of Cone, having been beaten to the first descent by a team of their countrymen from Tromsø who were just one day ahead of them. In a long day from their base camp the team then climbed a twin-horned peak they referred to as Styggehorn (3503m) overlooking the Christian IV glacier which they believed to be the highest unclimbed mountain in Greenland. They then moved to the east to the Bergen gletscher area and set up a new base from where they made claimed first ascents of peaks named as Anita Fjeld (2466m), Ebeth (2628m), Snefjeld (2650m) and Istind (2667m) with ski descents of the first two. In the early part of the trip they experienced temperatures of -10°C to -30°C, but towards the end of May it warmed to -5°C - +5°C. The Alpine Journal 2005, Volume 110, No 354, pp 292-293. The Journal of the Alpine Club, Edited by Stephen Goodwin. Area Notes, edited by Paul Knott, contributed by Derek Fordham. Published jointly by The Alpine Club & The Ernest Press, ISBN 0 948153 79 2.